What is cinema? Does this question still make sense today, in this age of CGI, digital cameras, heavy post-production effects, with movies distributed in a variety of formats, from the smallest screen (cellphones) to the biggest (IMAX), with the proliferation of home-made videos, with television series and video games increasingly looking like movies (and movies increasingly looking like video games), with the ubiquity of all kinds of moving images, with the rise of new media, etc., etc.? “What was cinema” seems like a better question, but I’m not ready yet to declare cinema dead, like it has been quite fashionable to do for some time (since the advent of the VCR in the 80’s at least). Like I wrote last time, I’m mostly interested in computer-generated imagery for this blog, and how it can be incorporated (or not) in the photographic image, but CGI is merely one of many factors responsible for the profound changes happening now in cinema. In this context of ever-changing technologies and constant metamorphosis of the moving image, clinging to the idea of a “pure” cinema, like I did in my introduction last week, is clearly hopeless. But is there such a thing as “pure” cinema in the first place? Most film theorists (if not all) would say no, there isn’t. There are many reasons for this (the industrial nature of cinema, the fact that it’s a collective effort, Alain Badiou’s mix of art and non-art), but I want to focus on one for now, more related to our subject: cinema, by essence, is an amalgam of many art forms. It’s less the seventh art than the addition of the previous six. So, why is it so different now with CGI? Can’t we just say cinema has integrated animation like it did with theater? In a way, yes, cinema is moving in a new direction due to the influence of CGI, but animation is an intruder in the photographic image, in a way that wasn’t true with other art forms. Indeed, cinema is impure, but even if it can borrow heavily from theater (for the mise en scène), literature (for the screenwriting), painting (for the framing) and music, none of these challenge the specificity of cinema: the succession of photographic moving images. CGI, though, as a form of digital animation, is an intruder, a radical Other that is tearing apart the fabric of the photographic image. It’s not necessarily a problem, but then we have to find a way to wed these two opposite forms in a meaningful way; it’s the question I want to adress in this series titled Imitation of Life: how did cinema approach this question in movies mixing CGI with the photographic image? André Bazin, as always, provides the best starting point for this discussion. In his article “Editing Prohibited” (1953), Bazin seems to be advocating for a natural realism of the photographic image that the editing has to respect: no editing, because cinema should not “cheat” reality. Instead, cinema has to preserve on film the integrity of the situation depicted. This does not mean that cinema has a duty to offer a 1:1 representation of reality, but rather that cinema has to “re-present” reality through the artist’s vision, while conserving the ambiguities and elusiveness of the real world, so that the spectator can see reality again for the first time. It’s this famous passage in “Ontology of the photographic image” (1945), maybe the most beautiful account of cinema: “Only the impassive lens, stripping its object of all those ways of seeing it, those piled-up preconceptions, that spiritual dust and grime with which my eyes have covered it, is able to present it in all its virginal purity to my attention and consequently to my love.” The following sentence speaks of photography as a “natural image of a world that we neither know nor can see”, but the verb tense is quite different in the original text in French: Bazin uses a past tense that has no equivalent in English (l’imparfait de l’indicatif, an action beginning in the past and still ongoing at the moment of the enunciation), suggesting that we did know, at some point, to see the world, but that, in the turmoil and the habits of everyday life, we somehow lost this knowledge that photography can restore. So this “virginal purity” doesn’t stand for reality as seen in a completely objective way, but rather for a forgotten, unprejudiced look at a naturally ambiguous and mysterious reality. Cinema, then, has an ethical duty towards reality, because it’s his first creative material, and so must stay faithful, as best as possible, to the essence of a situation. With these nuances in mind, coming back to “Editing prohibited”, we can say that although Bazin does prefer long takes over rapid editing, because it’s often a good way to preserve the ambiguities inherent in reality, his article is far more nuanced than the title suggests. 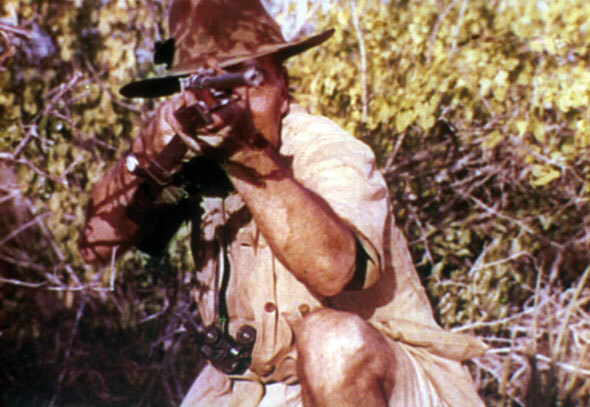 In a lengthy footnote, he uses the example of a scene from Where no vultures fly (1951), in which a young boy in Africa finds a baby lion, briefly left alone by his mother. The boy takes the lion in his arms, but the mother is not far; she sees them, and silently begins to track the kidnapper. At first, the sequence is made of shot reverse shot (one shot of the young boy, and cut to another shot of the mother), so that the boy and the mother are never in the same frame. But in the last image of the sequence, the lion’s mother, the boy and his parents all share the same space, in a single wide-angle shot. Like Bazin says, whether or not the predator and his prey are in the same shot doesn’t change the anecdote: either way, it’s still the story of a lion chasing a young boy. But when both the predator and its prey share on screen the same space, the movie reaches the “apex of cinematographic emotion”. It doesn’t matter if the lions were tame, or that the actor is not really in danger like his character is because “here, realism lies in the homogeneity of space”. To take another, more obvious example: in a movie portraying a magic trick, say the classic bunny-out-of-a-hat, we would probably not be very impressed if there’s a visible cut between the empty hat and the bunny getting out. We would know it’s a simple editing trick, with no “real” magic involved. In order to give a chance to the spectator to believe in the prowess of the prestidigitator, the trick has to be shown in one long take, respecting the integrity of the live performance. Or think of action scenes: the pleasure of seeing a Jackie Chan movie lies in the knowledge that he did all the stunts himself. No wires, no CGI, no trick: this is real. At least this is the promise made by the marketing department and the actor, but it’s telling: the action is supposedly more thrilling because of its faithfulness to the real stunt, because we believe that at some point in the past Jackie Chan really did what we’re seeing on screen. The movie re-presents what Jackie Chan did. In the last decade, the discourse around the movies has changed: movies are not promising thrilling action made by real actors anymore, but instead are trying to amaze us by all their new representational possibilities. Musicals and action films (at least up until the early 90’s), two genres relying on the spectacle of human bodies in motion, were tailored for their performers: look at what the actor/dancer/bodybuilder/athlete can do! Since the advent of CGI, there’s no need for an actor/performer because the performer now is the image itself: look at what I can create, says the digital artist. The problem with CGI becomes clear: with current technologies, we can represent any magic tricks we want, but how can we still believe in them if everything is possible? If the ontology of the photographic image supposes that the artist has to re-present reality so that we can see it again in all its “virginal purity”, is such a thing still possible when we seamlessly integrate CGI with film? If the essence of the bunny-out-of-a-hat lies in the continuity of the action, can a movie stay faithful to this essence by using a CGI bunny? If the boy and the lion are in the same frame, but the lion is not real, can we still feel the danger? (As we will see in a later article, this is the question Life of Pi wants to answer, by using a tiger instead of a lion. That’s why I used Bazin’s footnote instead of his main example in “Editing Prohibited”, Lamorisse’s Red Balloon, because of this similarity between the wild beast/young boy situation at the heart of Ang Lee’s movie.) We may think that Hollywood doesn’t care about these questions and just want to display on the big screen these new technologies in the most seducing and ostentatious way, but for a while, Hollywood entertained quite an ambiguous relationship with CGI. Sure, the discourse around the movies wasn’t ambiguous at all: in interviews, the artists were mainly delighted to be working with these new tools (there are a few exceptions, of course), and all the promotional material was celebratory (look how convincing this is! ), but this is not what the movies themselves were saying. Even one of the most prominent pioneer of CGI like James Cameron was far more pessimist in his movies than in his interviews, at least until Avatar, where he completely turned his body of work upside down, as we will see. It was also the case with Robert Zemeckis, another leading figure in these matters. As far as I know, Who Framed Roger Rabbit features no CGI, but since we already established last time that CGI is a form of animation, the parallel is quite justifiable. And anyway, animation is a completely different medium than live-action cinema, so a wedding of these two art forms is not easily made, so Zemeckis’ movie can give us a first idea of how to make it meaningful. 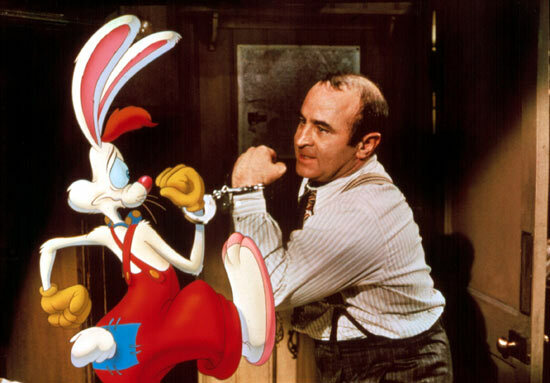 In Who Framed Roger Rabbit, toons have a special status that differentiates them from humans; there’s no illusion there, like there is with most CGI nowadays, because toons are meant to be toons and nothing else. Animation is not trying to represent reality, on the contrary, it is explicitly defined as animation, and by doing so the movie preserves the integrity of the photographic image. In fact, the movie presents a lone confusion between animation and real-life, and it is the main villain, a toon trying to hide behind human form. The movie is quite clear: animation and cinema can live together as long as they’re clearly delineated, but the illusion of one trying to look like the other is pure evil. But like I said, it’s more ambiguous than this, because at the same time, Zemeckis is trying to accommodate us to the idea of animation and photographic image living in the same space: toons are not exactly intruders in the world of the movie, but the main character, Eddie Valiant (Bob Hoskins), hates them ever since one of them killed his brother. His mistrust represents this difficult conciliation between animation and photography, the reticence of the photographic image to accept this intrusion of animation. More importantly, Eddie has to learn to love and accept the toons, just like the director, Robert Zemeckis, is trying to convince his audience that animation can be integrated in a photographic image in a meaningful way. It’s no coincidence if Zemeckis has since become one of the chief promoters for CGI: with Who Framed Roger Rabbit, he was paving the way for his future cinema, subtly introducing the idea of a new hybrid form of cinema, until he could seamlessly integrate a CGI floating feather in a photographic image. This time, though, it was an illusion, a digital magic trick, but in 1994 photorealist CGI was not evil anymore, and rare are the movies that still try to think about the inclusion of intrusive forms like animation. This movie doesn’t answer our questions yet, but it’s a small example of how Hollywood represented these new technologies, and what they thought of them. Zemeckis found one way to meaningfully integrate animation, by clearly separating what belongs to animation and what belongs to film, but other means have been used, as I will continue to explore in my coming articles.